Migrant workers wear panda hats on a freezing cold day in Beijing. 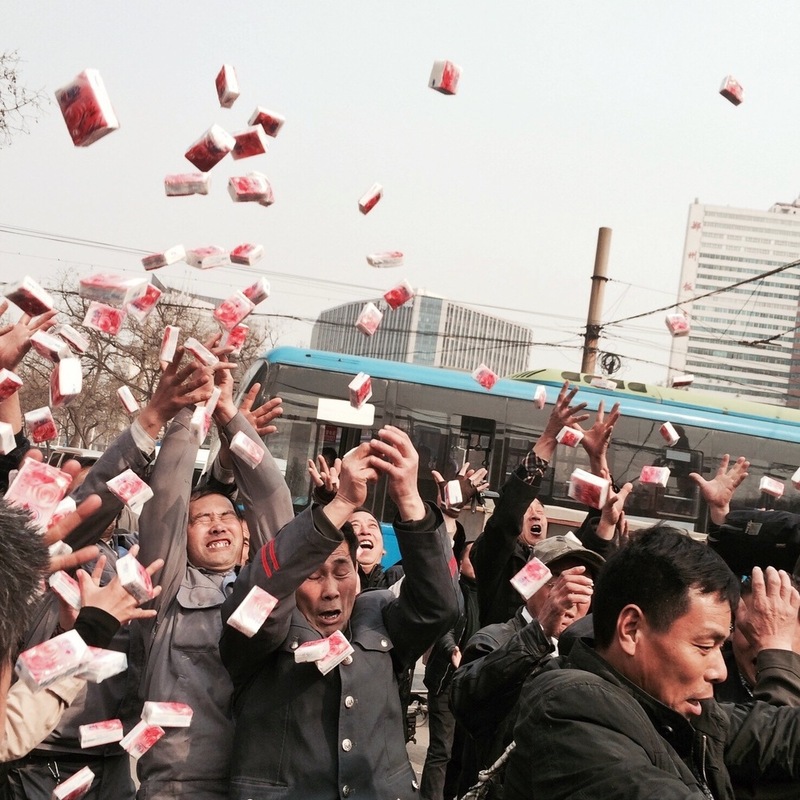 Factory workers scramble to catch free paper napkins thrown from a stage during a promotional event. Zhengzhou. 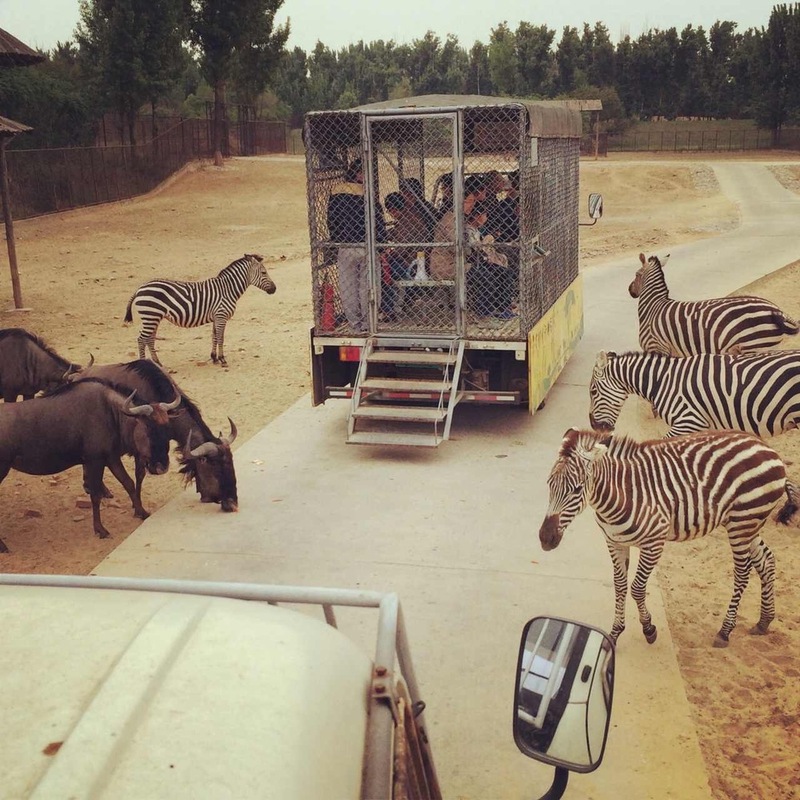 Zoo visitors locked in a cage drive through the African wildlife enclosure. Beijing. A winter swimmer relaxes in frozen Houhai Lake, Beijing. 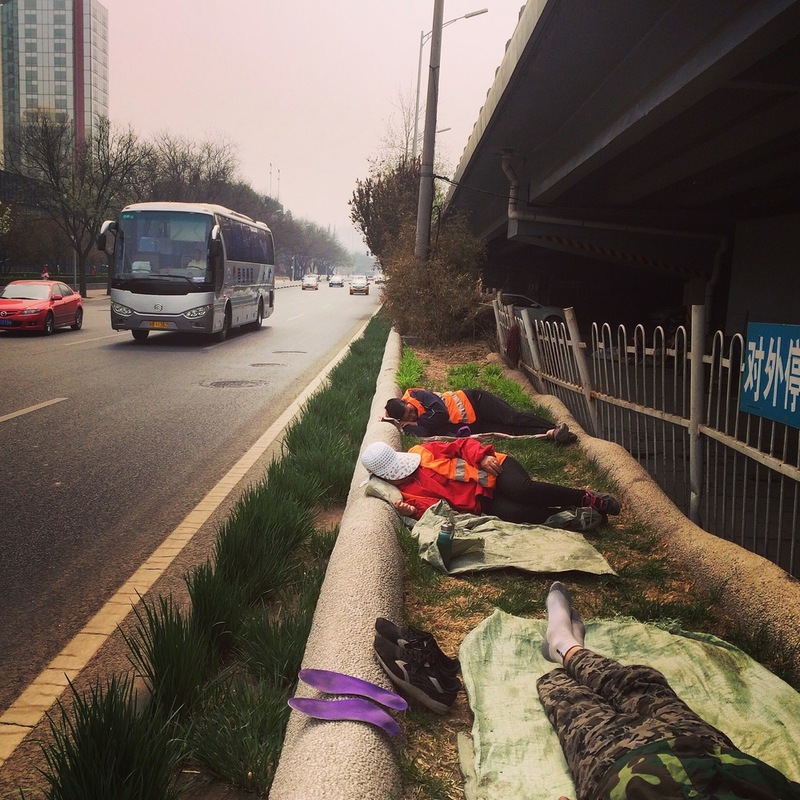 Street sweepers take a nap beside the Third Ring Road, Beijing. 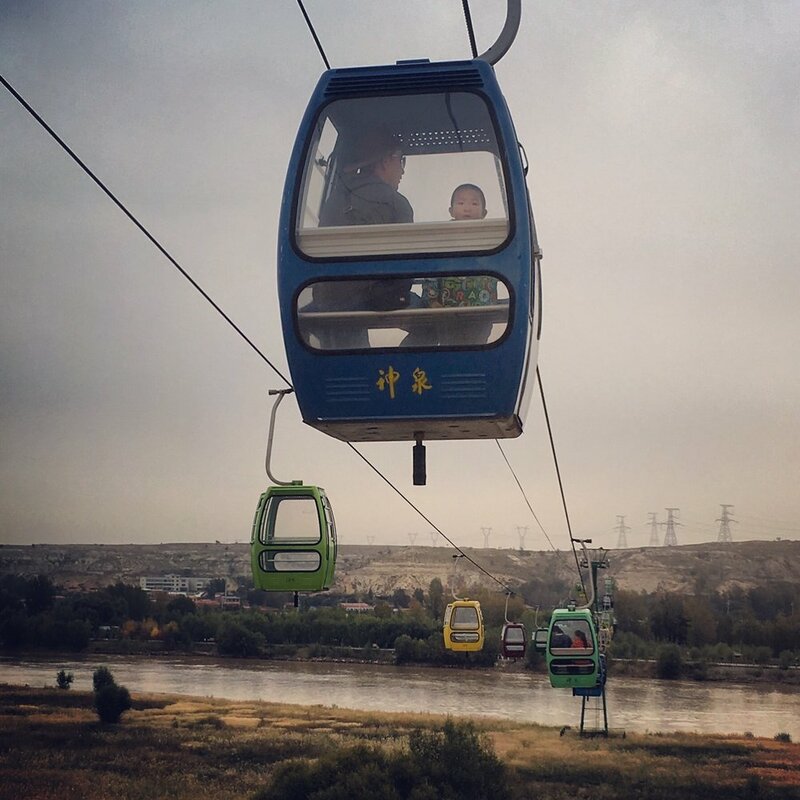 A man and his grandson cross the Yellow River in a cable car. Inner Mongolia. 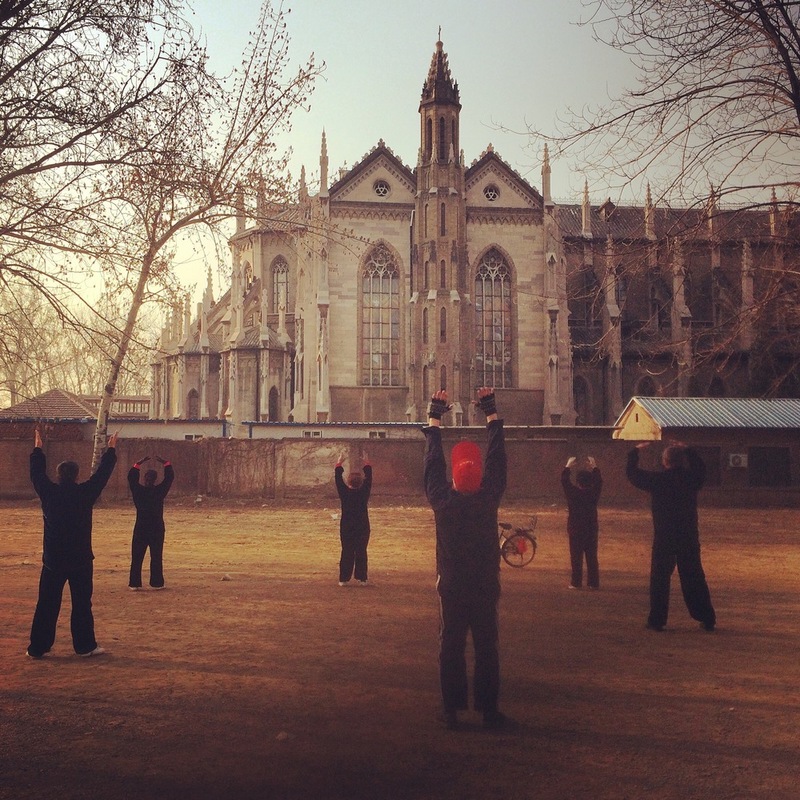 Elderly Chinese practice taiqi outside an old Catholic church, Jinan. 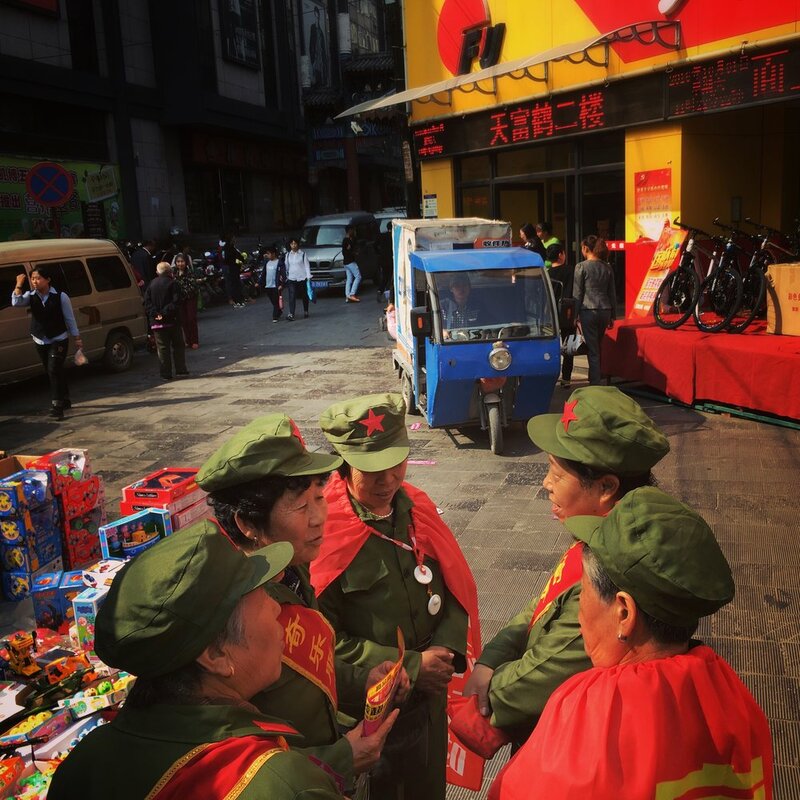 Old ladies dressed as Red Guards strategise before handing out promotional flyers for a supermarket. Zhangjiakou. 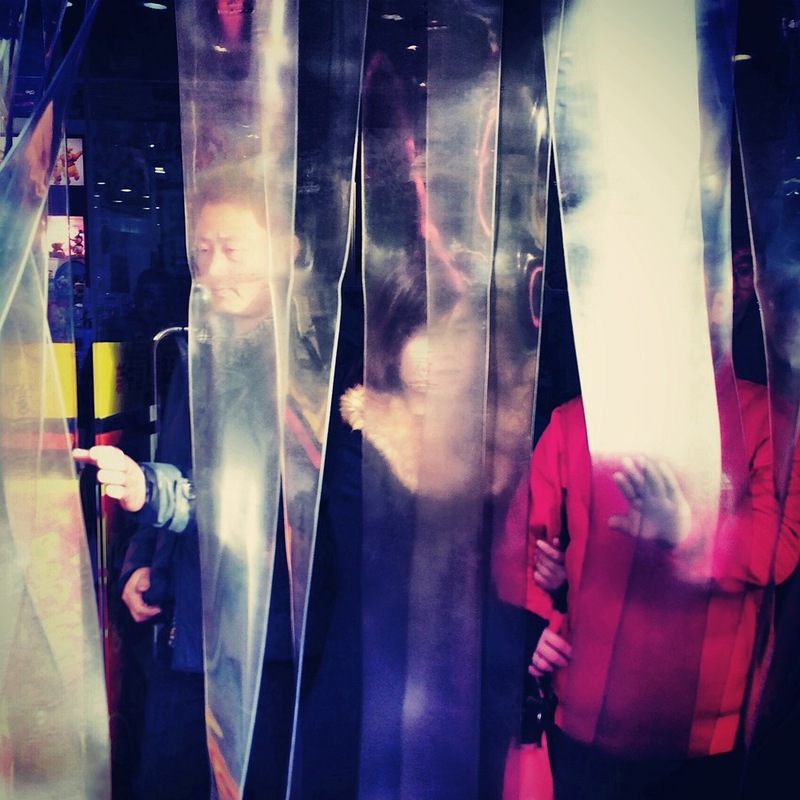 People exiting a shopping centre through plastic wind curtains, Beijing. 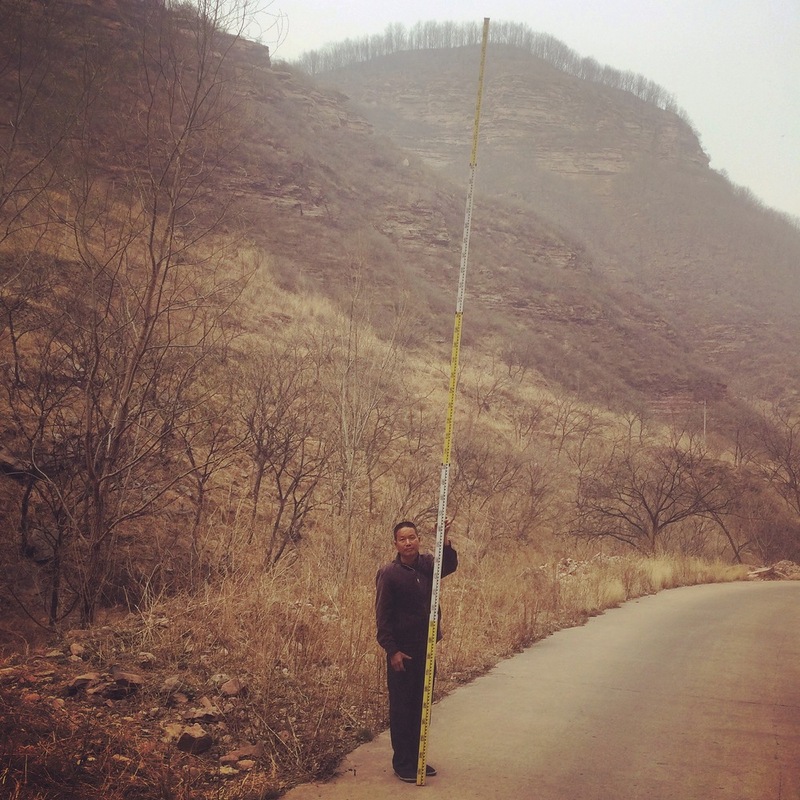 A rural road surveyor, Hebei Province. A monkey trainer walking his monkeys before a show. Henan Province. Chinese tourists dressed in Mongolian outfits in the deserted "ghost city" of Ordos. 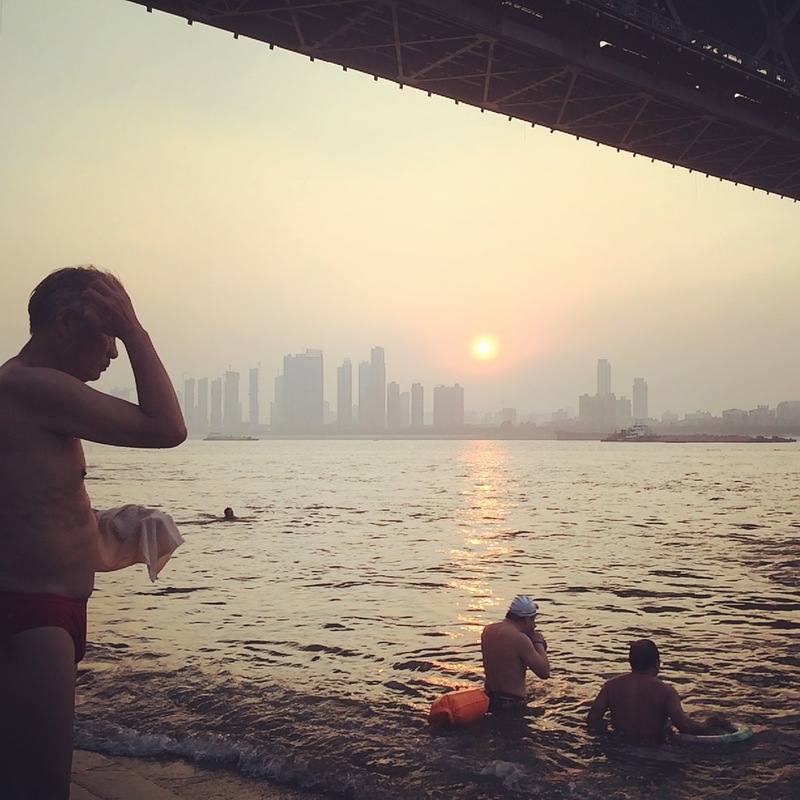 Old men take a swim in the Yangtze River, Wuhan. 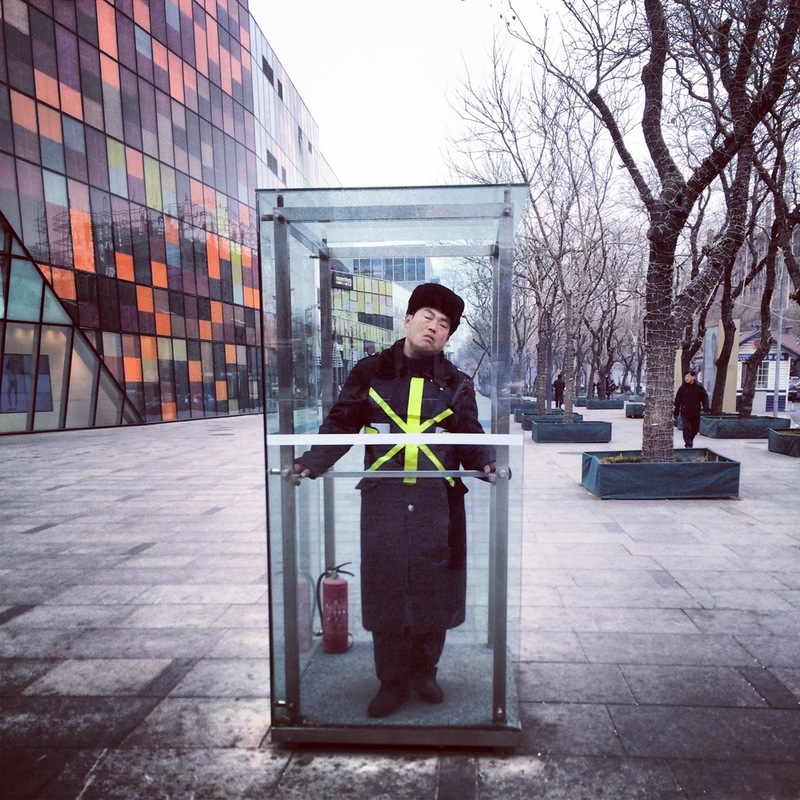 A guard takes a quick nap in his box at a luxury shopping mall in Beijing. 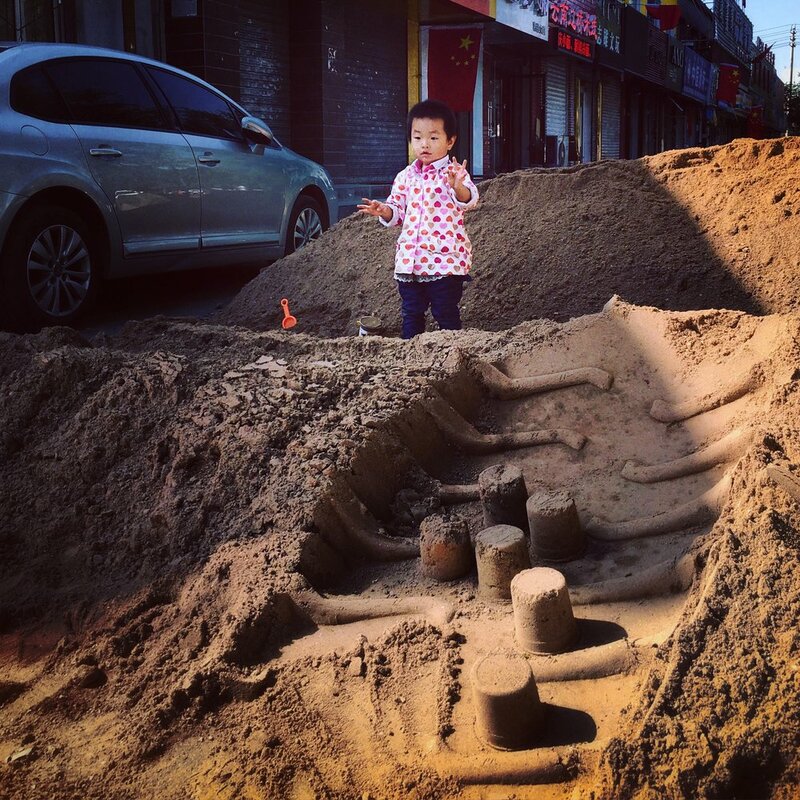 A little girl builds sand castles in the tire tracks of a construction site. Hohhot. A truck driver surveys a long tailback of coal lorries stuck in a traffic jam. Hebei Province. A heavy metal busker performs on a Beijing street in winter. 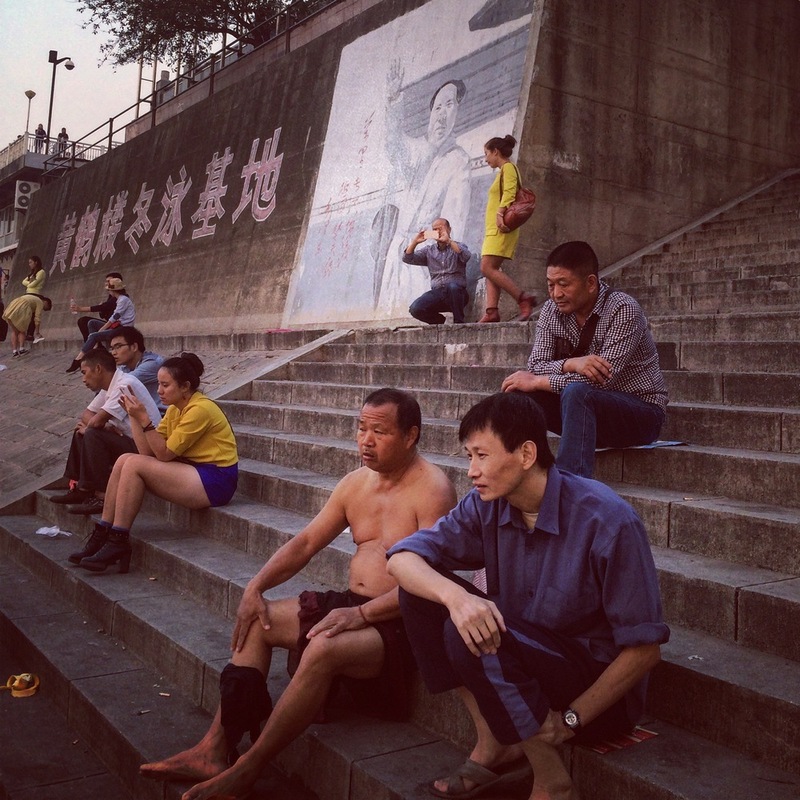 Locals relaxing by the Yangtze River where Chairman Mao famously took a swim to prove his stamina as national leader. Hubei Province. 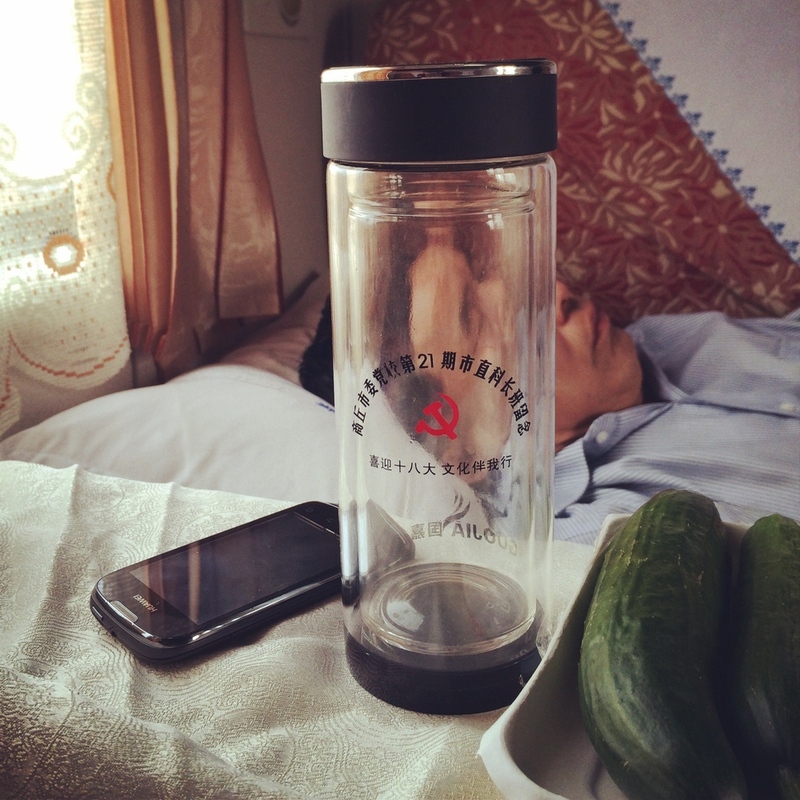 A provincial CCP official in a soft sleeper train carriage, returning from a mandatory training course in Beijing with a commemorative flask. High school kids wading paddling in the Yangtze River, Wuhan. 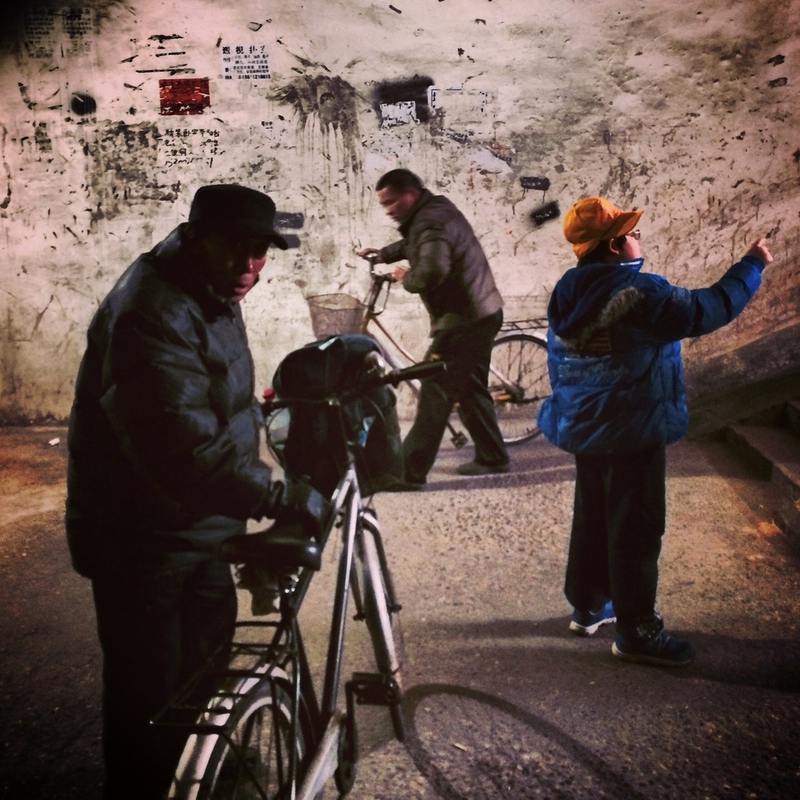 Bicycle commuters in an underground tunnel. Beijing. 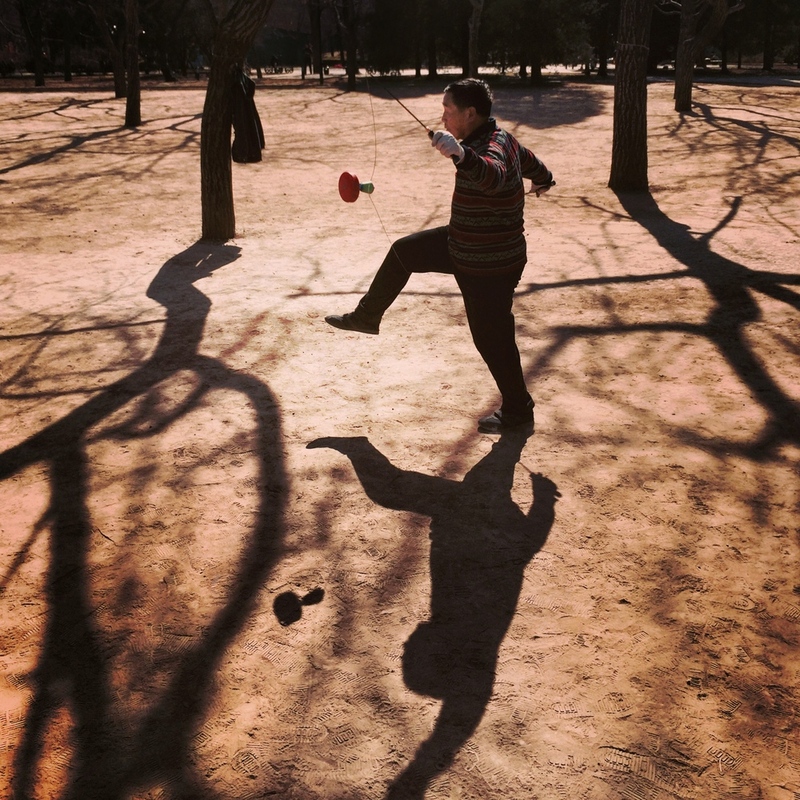 An old man practices with a diablo in a park in Beijing. A man carrying giant balloons advertising a supermarket, Beijing. 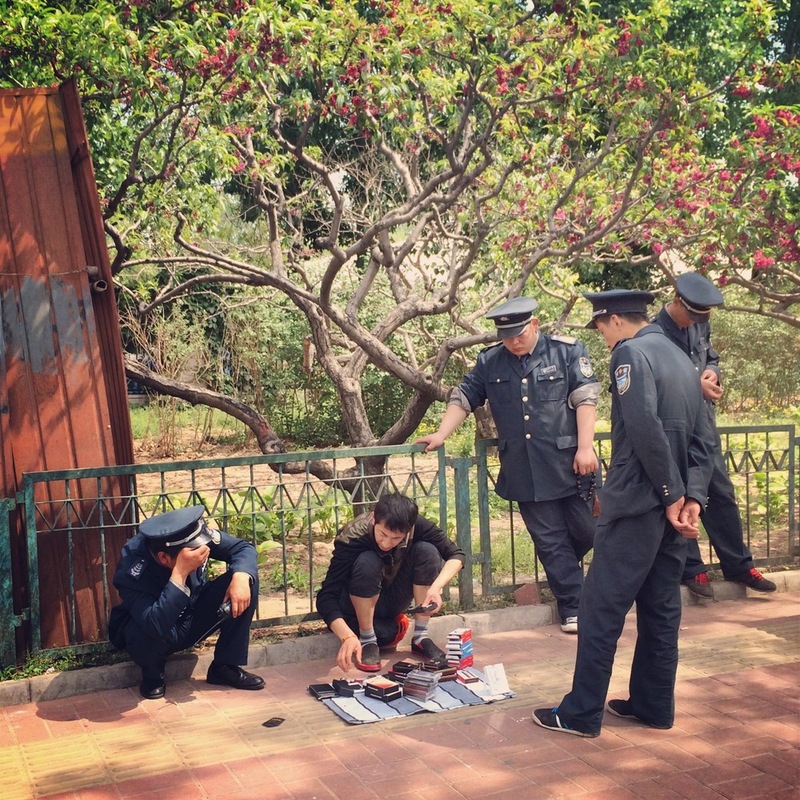 A street seller swarmed by chenguan, detested urban management officials who police the streets. Beijing. 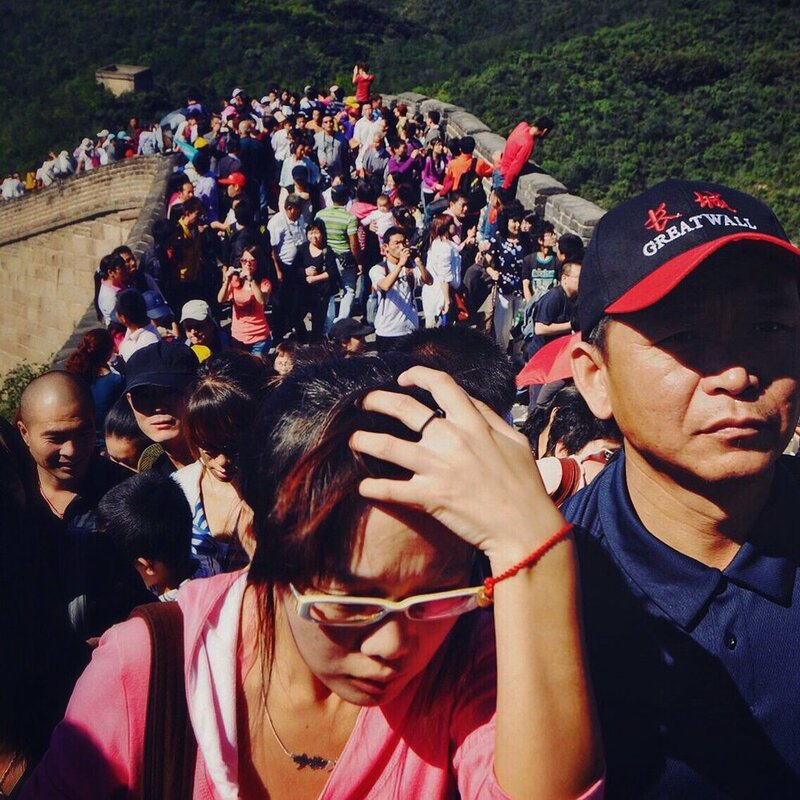 The Badaling Great Wall during National Holiday Golden Week, Beijing. 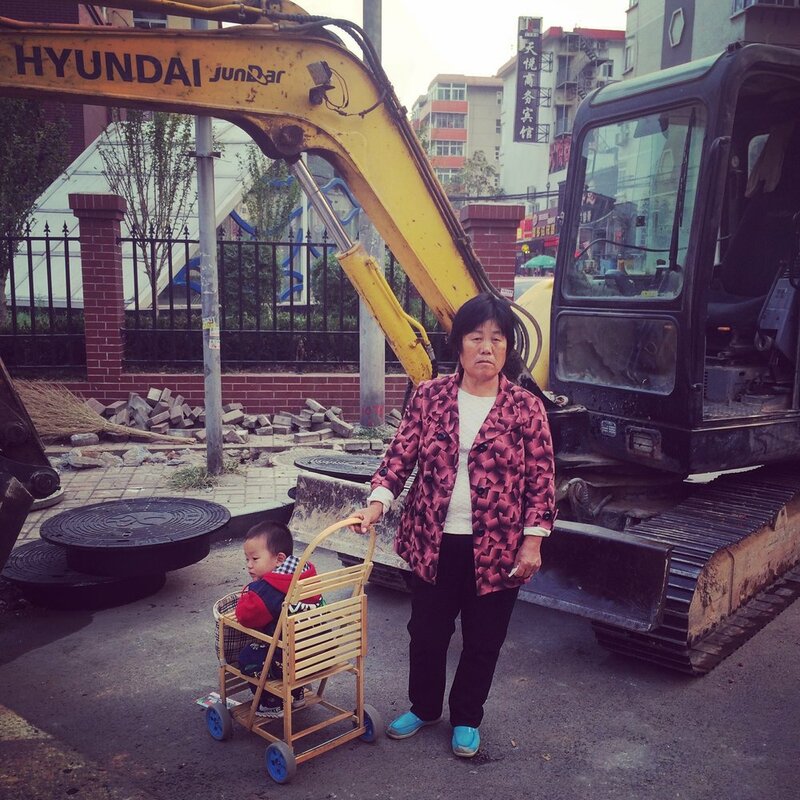 A grandma pushes her grandchild in buggy, Jinan. 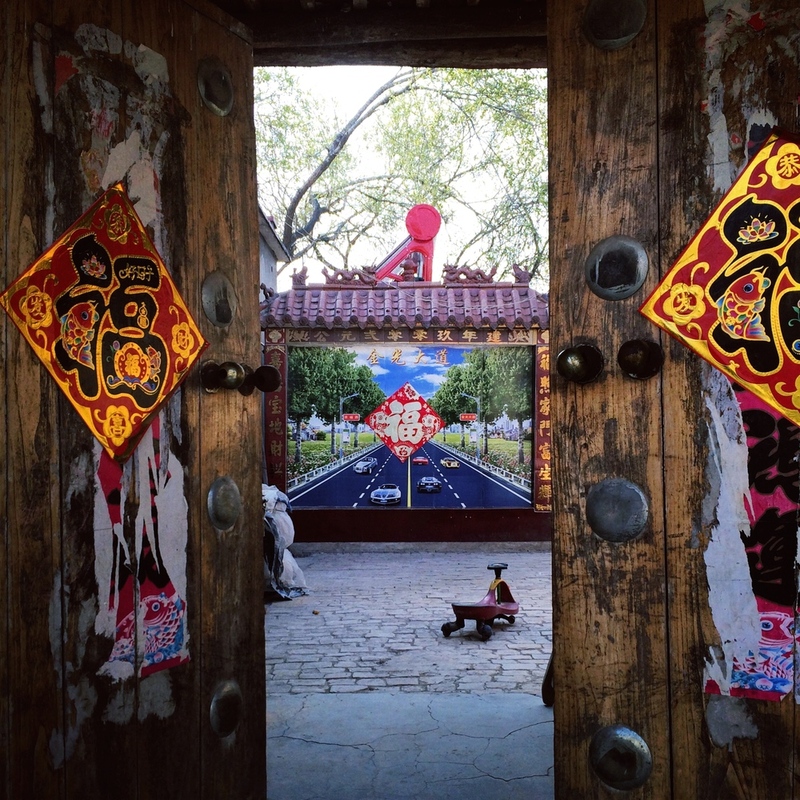 A "ghost gate", meant to keep evil spirits from entering homes, decorated with a picture of modernity. Henan Province. 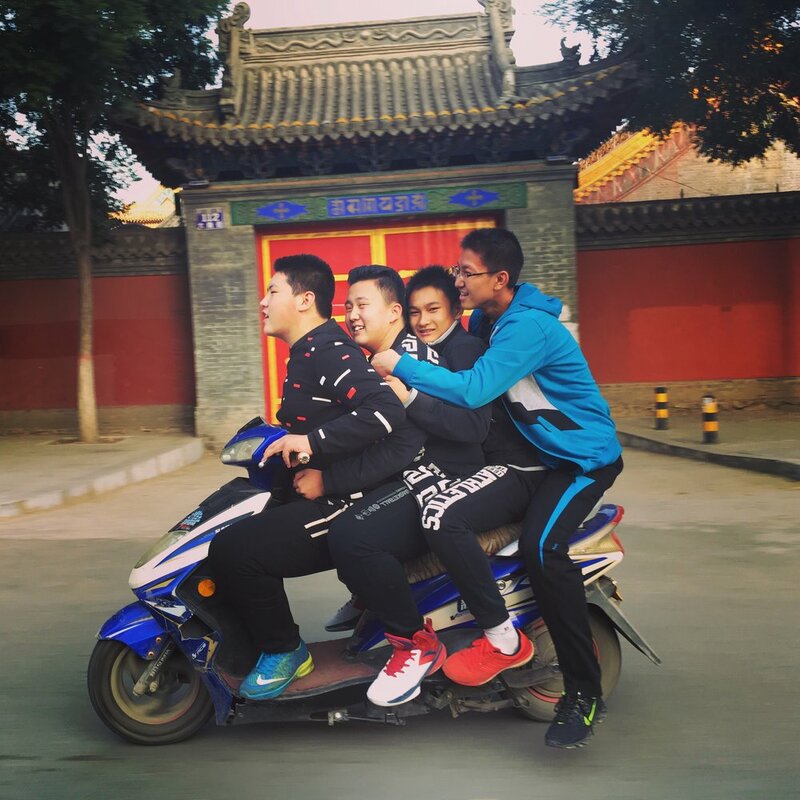 Four boys ride a motorbike in Hohhot, Inner Mongolia. 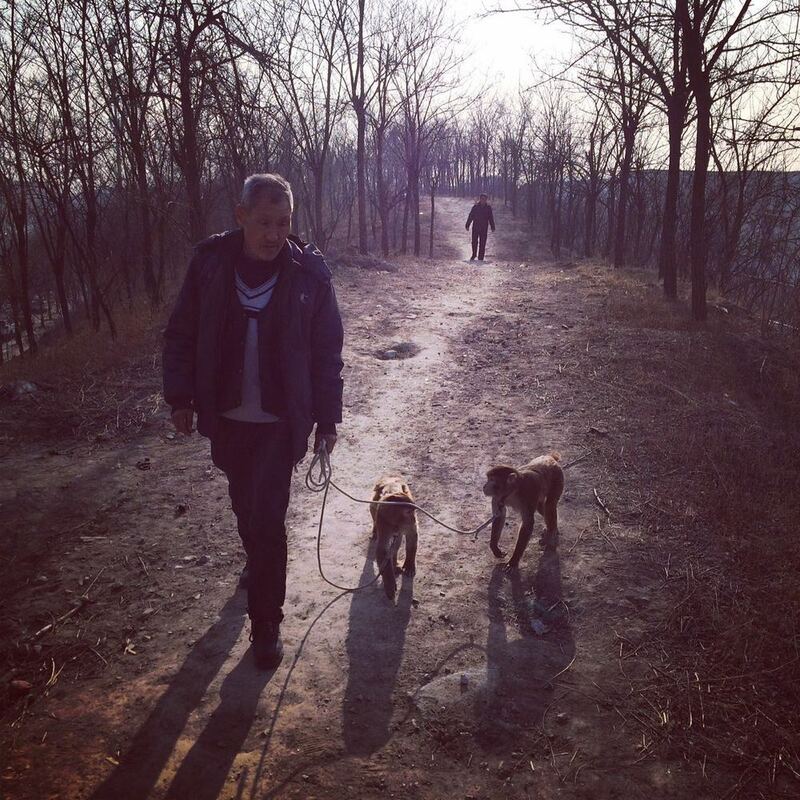 An old lady attempts to cross Beijing's Third Ring Road on the most polluted day of the year (AQI approaching 800). 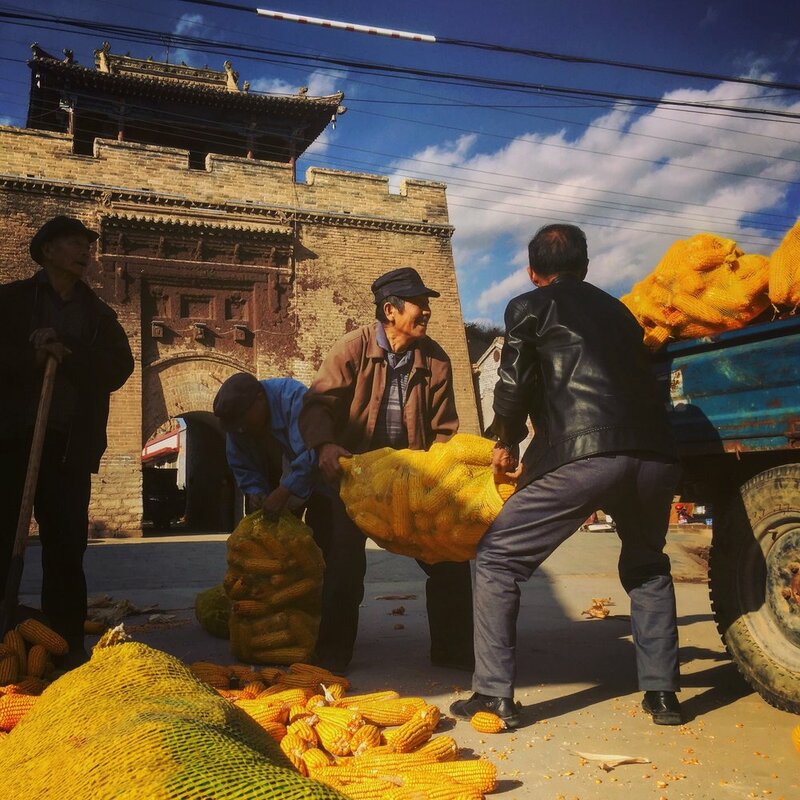 Farmers wrap up the corn harvest in a village in Shanxi Province. Kids pass an under construction apartment block on the way home from school in Lanzhou. 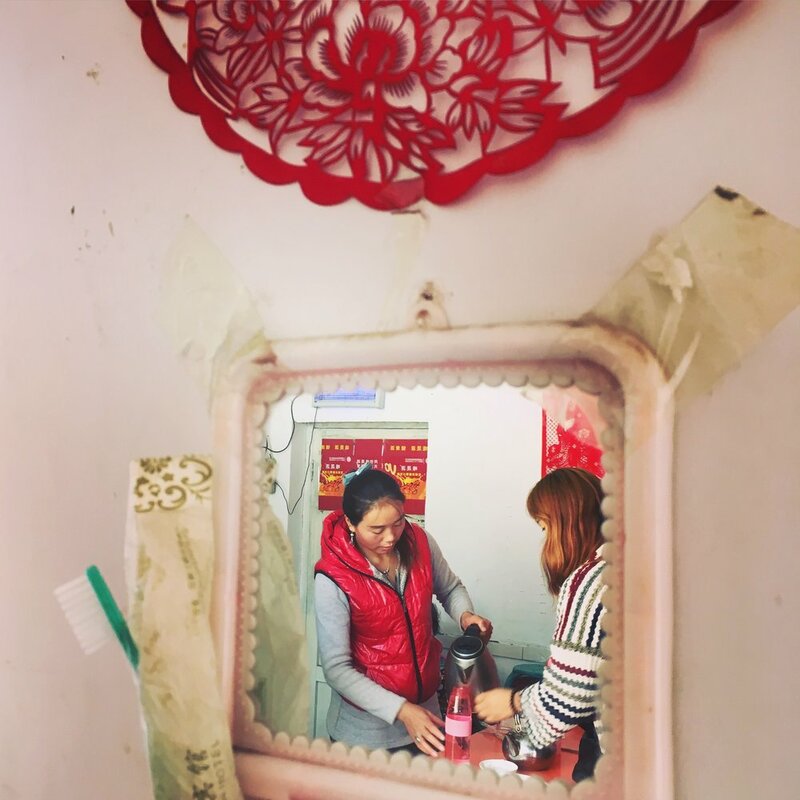 A waitress offers to fill up a customers flask full of hot water for the journey home, in a rural restaurant in Shanxi Province.